the dreaming, based on A Midsummer Night’s Dream by William Shakespeare,was commissioned and premièred by the National Youth Music Theatre (NYMT). Composed by Howard Goodall, with lyrics and book by Charles Hart, it was first performed at Northcott Theatre, Exeter in August 2001. Subsequent performances by NYMT over the next year took place at The Linbury Studio Theatre, Royal Opera House Covent Garden in December 2001 – January 2002, at Guildford’s Yvonne Arnauld Theatre in August 2002, and at The Edinburgh Festival Fringe at the George Square Theatre in August 2002. 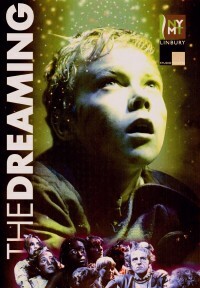 Since then, the dreaming has been performed by the Birmingham School of Acting in April 2003, by Broadwater School, in Godalming, Surrey, in March 2004, by Carey Baptist Grammar School, in Victoria, Australia, in June 2004, and in a production at Kings College School Wimbledon in November 2004. Most recently it was produced at the Rose Theatre in Kingston by NYMT in July 2012 and 2013. Songs: Thursday’s Children, Dream-nights, Cuckoo-Song, Heart of the Wood, Love-in-Idleness, Jennifer, Night & Silence, The Legend of St George, The Banner of St George, Midsummer Madness, Under the Hill, The Rising of the Sun, Catch me if you can, Dreaming (The Dreaming). Characters: Julian (Lord) Melstock, Henrietta (Lady) Melstock, Charlotte, Alexander, David, Jennifer (the 4 lovers), Angel (leader of the boy-woodlanders), Sylvia (leader of the girl-woodlanders), Jack (the blacksmith’s boy), Rev Herbert Plum, Nick Cheek, Walter Grubb, Seth Wilmot, Jess Dunn, Bob Fry, Matthews, Bowles, boy and girl woodlanders. Link TheDreamingreview-2 to a review. A remastered and restored recording of the original 2003 cast performing Howard Goodall and Charles Hart’s the dreaming is now available on all digital platforms. It includes two tracks not previously included on the CD.